It is considered good, safe practice to store mason jars holding food with the rings (aka bands, aka screw bands, aka rims) off. Note this topic applies to sealed mason jars with food in them on a shelf at room temperature. For fridge storage of a partially-used condiment or jar of pickles, you will want the ring on to hold the lid in place. Who says you should take the canning rings off? 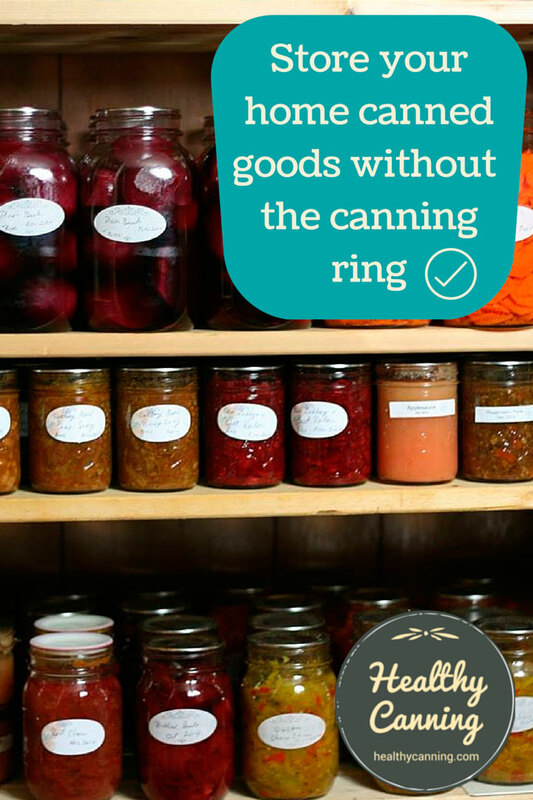 Why should you removing the canning rings after the jars are sealed? How to store your canning rings when not in use? Note that while removing the canning rings on sealed jars has become a firm commandment in some canning circles, it’s still considered optional by many professionals in the field. You can remove screw bands after the food has cooled if the lids are sealed.”  “Spice up the season.” National Center for Home Food Preservation blog: Preserving Food at Home. 14 February 2013. Accessed March 2015. 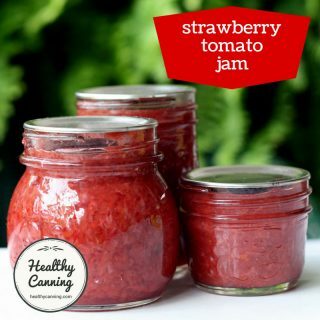 After canning, screw bands should be removed once the jars have sealed, instead of leaving them on the jars during storage.”  Carolyn Ainslie and Elizabeth Andress. When It’s Time to Store Canning Supplies. National Center for Home Food Preservation. December 2005. Accessed March 2015. A: We recommend storing your jars with the bands off. (1) If there is moisture in your band, they can start to rust and it becomes very difficult to get those off. (2) Another reason is that you have food that maybe has gotten under that band, around the neck, you get get some mould, grossness growing on it, and maybe you happened to underprocess your recipe, maybe you got busy with something else and distracted in the kitchen and you think you are done processing and you take it out and let it cool and then a few weeks later it starts to spoil, then you won’t really know that right away if you have your band on your jar. If you store your jars without the band and you happen to have spoilage, the bacteria and the microorganisms that are eating all that smorgasboard of deliciousness in your jar, they are going to create a lot of gasses and they are going to cause that lid to actually come unsealed. You’re going to smell that, especially with the bands off, you’re gonna know that something is not quite right which will obviously get you into your pantry or root cellar to figure out which jar it is and dispose of it properly. Another great thing about not storing with the band is again if there’s moisture you don’t need to worry about it being rusted and being that much more difficult to get off, and the third reason, which is one of my favourites, is that you have your band available for your next canning adventure … so it’s really a matter of personal preference, we just recommend without. Jessica Piper. Video: Canning Lids 101. [22:50] Accessed March 2015. Advice given in their HarvestPro Sauce Maker book (2016) would seem to indicate that some people at Ball at least are moving more firmly to the canning rings being removed. “Jars should be stored without the bands.” Ball HarvestPro Sauce Maker Recipe Guide. 2016. Page 21. In short, they are saying that you don’t want the canning ring artificially holding the lid down. The only real true, safe seal is a vacuum (aka hermetic) seal. Don’t rely on a tightened canning ring to hold the lid pressed down; it’s not a true and safe seal; it’s a false seal. 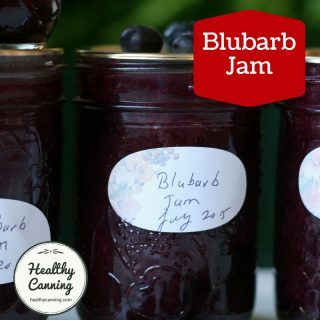 If bacteria starts to grow inside the jars, you want the lids to blow off with no canning ring falsely holding them in place; you want to see that there is a problem before you eat it or gift the jar to someone. This by the way is the same principle behind the Weck and Fowlers Vacola preserving jar systems, which both use clamps instead of a screw-on ring band to hold the lid on during processing. It is particularly important to remove the canning rings with alternative lid closure systems such as Tattler lids, which don’t ping or become depressed as they seal. You need to check physically that you have a seal by removing the canning ring and inspecting the lid. After you remove the clamps, for either Weck or Vacola jars, you would verify that you indeed got a vacuum seal, then wash your jars, label and date them, and store them away. Remove the rings, check that the lid has sealed. Whatever you do, even if you do want to store your rings with the ring on, still do the above step to ensure that you got seals. Don’t put jars away without checking the seal, and to do that, the rings must come off. Wipe down the jars and lid, let dry, then date and label and store jars. Note that you cannot process your jars without the rings on. You must have the rings on during processing to hold the lids down. But after processing, the rings have done their job for now — their work is over until the next jars are ready to be canned. Some people fear that if they remove the ring, the jar will come unsealed and the food ruined. This is not true. If the jar is properly sealed, removing the ring never lets the seal come undone.” Jackie Clay-Atkinson. Avoiding common canning mistakes. Backwoods Home Magazine. Issue #142 • July/August, 2013. Accessed March 2013. If the lid comes off while you are removing the ring, you never had a true seal to begin with and the food in the jar may not be safe, so you want to know right away. Some people are worried that without the rings, a bump is more likely to weaken the seal between the lid and the jar. Others reply that if the seal was that weak, there was a problem to start with. When transporting jars, or posting them, some people prefer to put the rings back on just in case. The Kerr company, though, who invented the two-piece metal lid system, has said in the past that it’s unnecessary to put the rings back on at all: “Can jars of home canned foods sealed with the KERR Mason Cap be moved or transported for several miles? Yes. The handling or shaking of the jars during transportation will not cause the seal on the KERR Mason Cap to release even though the screw bands have been removed.”  Answers to your canning questions. Kerr. Question 46, page 49. 1948. Accessed March 2015. 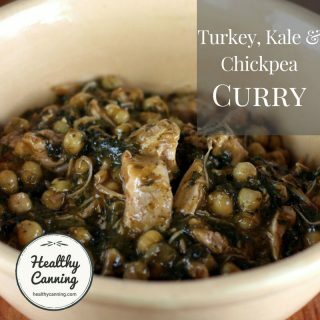 People get confused because they see so many photos of canned goods with the rings on, even on knowledgeable canning sites and in photos appearing in books from trusted sources such as Ball, etc. The reason the rings are on for the photos is simply because the jar can be more photogenic with a ring on: it hides any food that may have boiled and crusted onto the inside rim of the jar neck, and gives the jar overall a more gem-like appearance. Some people do a middle road: after removing the rings, checking the seal and cleaning the jars, they put the rings back on very loosely: they feel that that way, problem lids will still pop, but that they have the rings to protect the lids from inadvertent bumps, etc. Just before opening a jar, lift it gently a few inches by the lid rim (without the canning ring on.) That way, if your mind is absent and the lid seems to come off just a little bit more easily than usual while you are popping it open, you will at least know that the seal actually was good, and that you just got lucky with an easier-opening jar that time. Opened or unsealed jars holding moist food in the fridge. In this case, a ring is needed to keep the lid on and some air out so the food product will last longer in the fridge. See our page with ideas about how to store your canning rings when not in use. The recommendation to remove the canning rings goes back to at least the 1980s. We’re making a big effort to say: remove the ringband before you store jars,” [Dr Gerald] Kuhn said. “Then, if the lids become loose, it may well be an indication that the product underwent spoilage, swelled, and broke the seal of the lid. A loose lid is an indication that the product is now unsafe to eat.” Jenkins, Kathryn. New guidebook available this fall giving up-to-date home canning tips. Frederick, Maryland: The Frederick News-Post. 19 June 1986. Page F-1. Marisa McClellan. Why You Should Store Your Jars Without Their Rings. 31 October 2013. Sharon Peterson. 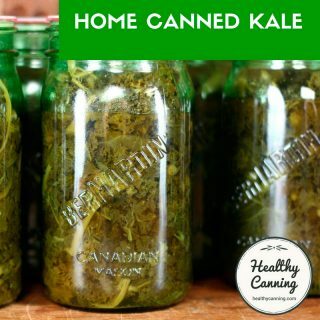 Storing Home Canning Jars, Rings on or off? 30 September 2014. 1. ↑ “Spice up the season.” National Center for Home Food Preservation blog: Preserving Food at Home. 14 February 2013. Accessed March 2015. 3. ↑ Carolyn Ainslie and Elizabeth Andress. When It’s Time to Store Canning Supplies. National Center for Home Food Preservation. December 2005. Accessed March 2015. 4. ↑ Jessica Piper. Video: Canning Lids 101. [22:50] Accessed March 2015. 5. ↑ Ball HarvestPro Sauce Maker Recipe Guide. 2016. Page 21. 10. ↑ Ball Canning Faq. Accessed February 2016. 11. ↑ Jackie Clay-Atkinson. Avoiding common canning mistakes. Backwoods Home Magazine. Issue #142 • July/August, 2013. Accessed March 2013. 12. ↑ Answers to your canning questions. Kerr. Question 46, page 49. 1948. Accessed March 2015. 13. ↑ Jenkins, Kathryn. New guidebook available this fall giving up-to-date home canning tips. Frederick, Maryland: The Frederick News-Post. 19 June 1986. Page F-1.